Post contains affiliate links. 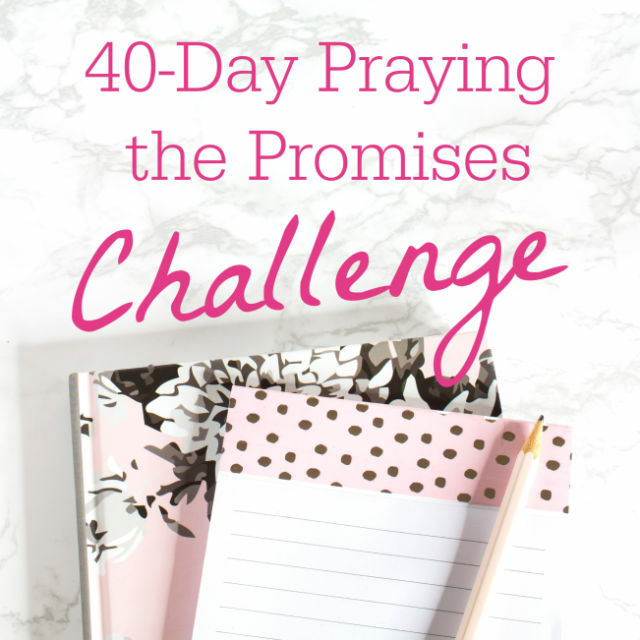 #LoveBlog challenges don’t pay for themselves! Get excited, blogging friends! 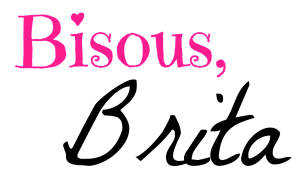 #LoveBlog is BACK, and it’s better than ever! Last year was my first time hosting any sort of major blog challenge. I blogged every single day in February. Counting the days in January and March, that meant I blogged 32 days in a row. While I was the only participant who blogged daily, dozens of bloggers joined me throughout the month. Some bloggers just participated by writing their own blog posts. Several more co-hosted #LoveBlog with me! Special shoutout to Charlene of Enduring All Things. One of my blogging besties, she co-hosted more than anyone, AND she co-hosted last year’s Instagram challenge with me. Looking back on the inaugural #LoveBlog challenge, I’m amazed at how successful it was. No, I didn’t have hundreds of bloggers participate. No, I didn’t gain thousands of page views. But I did inspire a community, at least for a month. My own posts from #LoveBlog inspired more comments than most of my blog posts do. I discovered new bloggers. My blogging friends discovered each other. And almost a year later, looking at the data from inlinkz, people are still reading what everyone wrote last year. Between the page views of my co-hosts and me, most of the link-ups now have over 700 views. Quite a few broke 1200 views. Those numbers might be small for some bloggers, but they’re good in my blogging book! 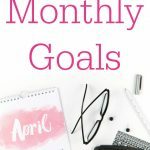 This year is only a blogging challenge, not an Instagram challenge. Last year Charlene and I did our best on Instagram, but participation was very low. The blogging challenge was much more popular! That said, I encourage you to promote your blog posts on Instagram. Use the hashtag #LoveBlog2017. Last year I discovered that a handful of other people used #LoveBlog in their posts, but the hashtag with the year should be unique for Instagram. This year will be a weekday daily blogging challenge. We get weekends off! I burned myself out last year, and I want to avoid that this year. I’m also working on a potential giveaway. While I still need to iron out the details, I envision either a second giveaway just for bloggers who participate, or a lot of bonus entries for linking up. Stay tuned! Most prompts are new, but I’ve included a few favorites from last year. The bolded word is the specific prompt. The questions are for inspiration on the different possible directions for this prompt. You do not necessarily need to answer all of them. Finally, this was an FAQ from last year that I want to address in advance this year. 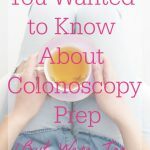 If you already have an old blog post that follows the prompt, yes, you can add it to the link-up. Limit yourself to 3 links per prompt. 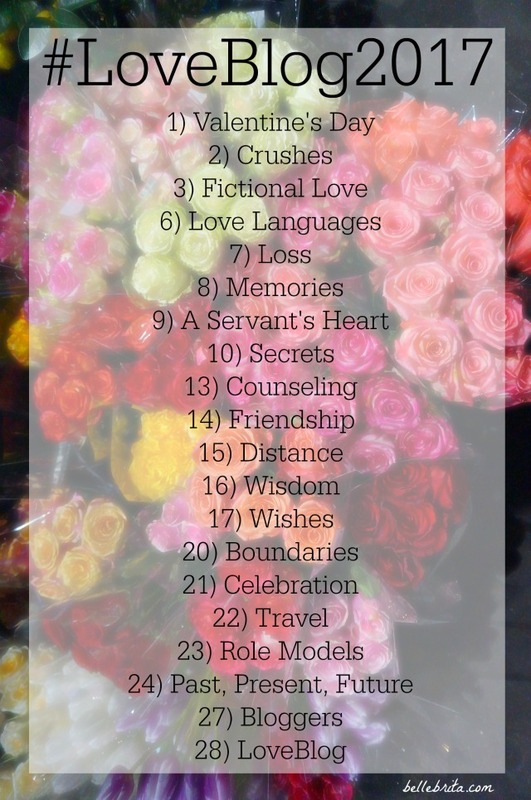 So if you wrote a separate post on each Love Language last year, you can’t share all of them for this year’s Love Languages prompt. 1) Valentine’s Day. How are you celebrating Valentine’s Day? What’s the best V-Day you’ve ever had? Do you love or hate the commercialism of the holiday? 2) Crushes. Who was your first crush? Have you ever crushed on more than one person at a time? How should couples handle innocent crushes in a monogamous relationship? 3) Fictional Love. Have you ever had a crush on a fictional character? Which TV couple is most like you and your significant other? Do you consider any fictional couples to be role models for good relationships? 6) Love Languages. 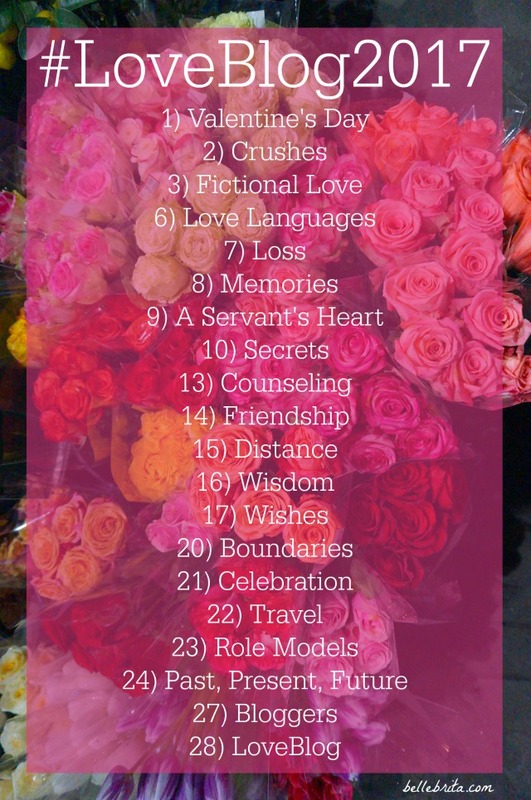 Have you heard of Gary Chapman’s book The 5 Love Languages? While I highly recommend everyone read it (check out the version for singles), you can also take the quiz online for free. Not only was this topic highly popular last year, all of the individual love language topics inspired many bloggers and blog readers! What’s your love language, and how does that affect your relationships? How can you intentionally practice someone else’s love language, even if it’s not your own? 7) Loss. What was your first breakup like? What do you do with a fading friendship? Have any of your loved ones died, and if so, how did you cope? 8) Memories. How did you and your best friend meet? When did you and your significant other first say, “I love you”? Do you do anything special to savor special memories? 9) A Servant’s Heart. How does your community serve you? What can you do to serve your loved ones? What does “a servant’s heart” look like in practice? 10) Secrets. How do you feel about secrets? Can keeping secrets ever benefit a relationship? What’s the difference between a good secret and a bad one? 13) Counseling. Have you ever attended couple’s counseling? What are your thoughts on premarital counseling? What are the pros and cons of seeing a counselor/therapist/psychiatrist? 14) Friendship. How do your friendships affect your other relationships? How do you go about making new friends? Do you have one best friend or several? 15) Distance. What leads to emotional distance in a relationship? How much distance do you keep between you and people other than your significant other? Have you ever been in a long-distance relationship? How do you maintain long-distance friendships? 16) Wisdom. What’s the best marital or life wisdom you’ve ever received? What about marriage can you learn from others, and what do you only learn from marriage itself? Who is the wisest person in your life? 17) Wishes. What do you wish for in life? If a fairy godmother could magically change any part of your life, what would it be? How do you grant wishes for the people you love? 20) Boundaries. What boundaries do you set with your friends and family? Does your marriage have any boundaries? Have you set boundaries just for yourself and your own feelings, words, or actions? 21) Celebration. What special occasions do you celebrate with your loved ones? How did you celebrate your marriage, or what does your dream wedding look like? What little things do you celebrate? 22) Travel. What family vacations did you take as a kid? Did you spend college spring break with friends, family, or both? What travels do you hope to do with your significant other? 23) Role Models. Do you have a mentor, either personally or in your career? Do you and your spouse look to an older married couple for guidance? Are you a role model for anyone? Why or why not? 24) Past, Present, Future. What moments or lessons from the past most impact your present life? What are you doing now to prepare for your ideal future? Which people connect your past, present, and future? 27) Bloggers. Why do you blog? Who are your favorite bloggers? How do you collaborate with bloggers? 28) #LoveBlog. Congratulations!!! You successfully completed #LoveBlog. What prompt was your favorite? Did you meet any new bloggers or find new blogging inspiration? I’m pretty easygoing about rules for blog link-ups. Tons of mandatory rules on other blog link-ups drive me crazy. I’d rather encourage blog community than forced blog follows. Thus only the first 2 rules are mandatory! (The 3rd rule is mandatory if you want to submit more than a single link). All the rest are optional. Each link-up will remain open for 3 days to give you time to catch up. Yes, you can link-up an old post (like from last year’s #LoveBlog! ), or even multiple posts, as long as they all follow the prompt. Please limit yourself to 3 links per prompt. Follow your host (that’s me!) and the co-host on your preferred form of social media. Use the #LoveBlog button and/or link back to the blog link-up. The more bloggers who link-up, the better! Share your posts on social media using the hashtag #LoveBlog2017. I will retweet as many as I can! Plus I will give you lots of love on Instagram if you feel like using the challenge hashtag. I am so excited for the opportunity to expand #LoveBlog! 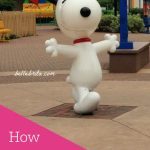 I wrote some great posts last year, and I loved seeing how different bloggers related to the prompts. Please share this post on social media! I created pinnable graphics, or you can click to tweet below. Join @belle_brita for #LoveBlog2017, a weekday blogging challenge in February! And if you’d like to co-host, comment below. I already have several lined up, but I would love to have 2 co-hosts for each day.